A technical jewel that celebrates force without limits. The innate talent trained day after day. The determination of a true champion. which brought the Italian flag to lead worldwide. of the sprinter Viviani on the tip. For real champions’ adventures on two wheels. The Structure Intarsia 3D Knit technology is born from the desire to create the most performing footwear in terms of ride's effectiveness. A material made up of thousands of intertwined threads that wrap the foot like a sock, assuring the highest standards of lightness, comfort and breathability. 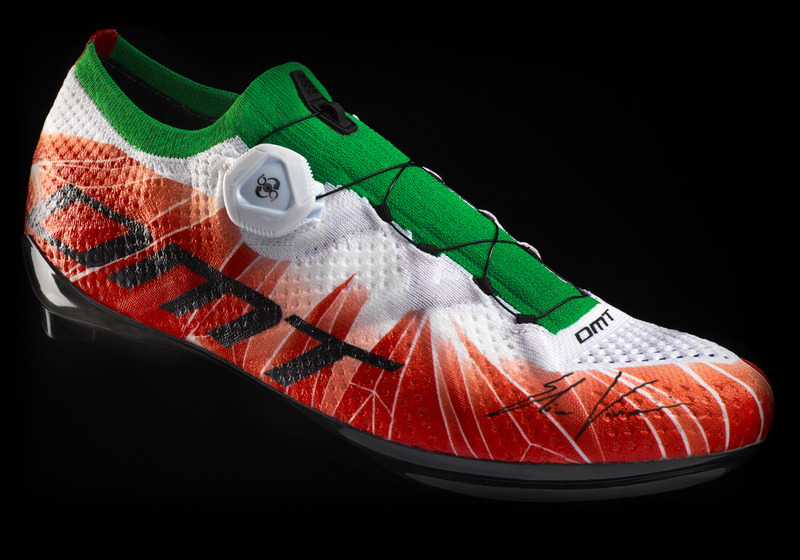 The result of the passionate collaboration with Elia Viviani, Italian and Olympic cycling champion, KR1 is the first 3D Knit Dmt shoe, a concentrate of technology dedicated to pro cyclists which, because of its innovative capacity in the field of cycling, we dared to call it a revolution. Using all of our experience in the field of "knit", with the most advanced machinery we developed an upper made up of intertwined threads, a sock-like fit offering an exceptional level of comfort. Once you try it you will not be able to go back. Reinforced toe and heel for a targeted structural support. Fine tuned curvature and angles for ergonomics and comfort in harmony with the pedalling movement. Upper in multi layer engineered 3D knit. Thicker reinforced central zone to maximize comfort and support under the Boa fit system cables. Integrated 3D knit channels for the Boa fit system webbing loops.